Diatoms were less inhibited by UV radiation under moderately increased temperature. Benthic diatoms were more resistant to UV radiation than planktonic species under extremely high temperature as found in the intertidal zone. These differential responses were linked to repair and damage processes of photosystem II. 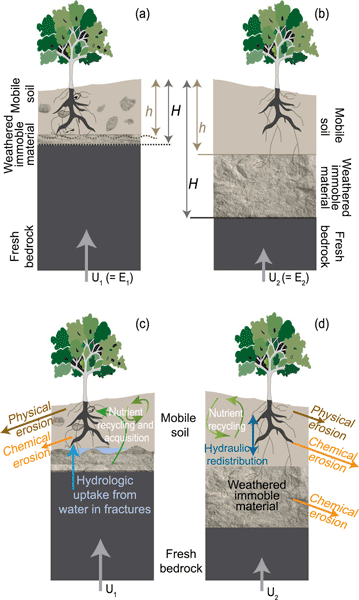 The results of this study highlight the changes of DOM composition in soil solutions and surface runoff, probably controlled by water-table dynamics and pre-event hydrological conditions. These changes should be taken into account for a better understanding of micropollutant mobility. Moreover, this work has implications for modeling DOM export in headwater catchments, as many studies assume that DOM transfer during storm events consists of the flushing of pre-existing soil solution DOM. The balance between organic matter (OM) fixation and decay is a major control on atmospheric CO2 concentrations. Understanding the environmental, chemical, and physical mechanisms that control the distribution of OM decay rates is therefore critical for constraining the global carbon cycle. In this manuscript, we derive a method to relate OM reactivity to its isotope composition using a kinetic model and provide a novel framework to discern the controls on OM decay rates. Earth system models (ESMs) are our main tools for understanding future climate. The Arctic is important for the future carbon cycle, particularly due to the large carbon stocks in permafrost. We evaluated the performance of the land component of three major ESMs at Arctic tundra sites, focusing on the fluxes and stocks of carbon. We show that the next steps for model improvement are to better represent vegetation dynamics, to include mosses and to improve below-ground carbon cycle processes. In this study we show increasing organic matter (OM) content on ferrihydrite surfaces enhances Fe reduction by the model Fe reducer S. oneidensis and a microbial consortia extracted from peat. Similarities in reduction rates between S. oneidensis and the consortia suggest electron shuttling dominates in OM-rich soils. Community profile analyses showed enrichment of fermenters with pure ferrihydrite, whereas OM–mineral complexes favored enrichment of Fe-reducing Desulfobacteria and Pelosinus sp. We quantified different biogenic Si pools in soils of a developing ecosystem and analyzed their influence on short-term changes of the water soluble Si fraction. From our results we concluded small (< 5 µm) and/or fragile phytogenic Si structures to have the biggest impact on short-term changes of water soluble Si. Analyses of these phytogenic Si structures are urgently needed in future as they seem to represent the most important driver of Si cycling in terrestrial biogeosystems in general. Photosynthesis by phytoplankton is a key source of oxygen (O2) in aquatic systems. We have developed a mathematical technique to calculate the rate of photosynthesis from time series of O2. Additionally, the approach leads to a better understanding of the influence on O2 measurements of the tides in coasts and estuaries. The results are important for correctly interpreting the data that are gathered by a growing set of continuous O2 sensors that are deployed around the world.